The director of FIIAPP, Anna Terrón, and the president of the Inter-American Court of Human Rights (I/A Court), Eduardo Ferrer, have advanced on issues such as strengthening the Euro-Latin American dialogue on Human Rights; the exchange of experiences and good practices with homologous European courts and the strengthening of the connection between the Inter-American Court and the Latin American national courts. 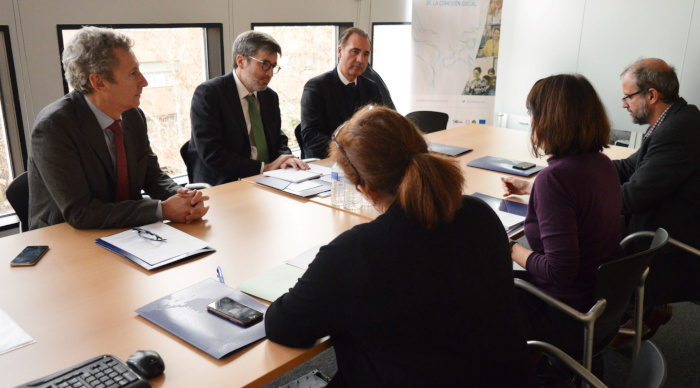 Representatives from the I/A Court, the EUROsociAL+ team and Judge José De La Mata were also present at the meeting. The EUROsociAL+ programme, which is financed by the European Union and managed by FIIAPP, is based on the view that human rights act as a guarantee of equal opportunities and discrimination-free access to welfare through the promotion of sustainable public policies for social cohesion. EUROsociAL+ has, thus, been working on access to justice since its first phase, providing specialised knowledge to improve the protection of certain vulnerable groups. The I/A Court is a judicial body of the Organization of American States (OAS) whose objective is to apply and interpret the American Convention on Human Rights and other human rights treaties to which the Inter-American Human Rights System submits.